Angel City Audio: Melody Valve, Jupiter Condenser, M&G Audio, Skogrand Cables. Glossy black chassis bedecked this room full of Melody electronics: Melody Pure Black 101 preamp ($4’999), Melody MN845 monoblocks ($13’59/pr), an Onix CD media player (personal unit from the host’s own system) and the new Angel City Audio Seraphim speakers (3-way floorstanders, 91dB, $TBD). M&G Audio provided the speaker cables and interconnects and Skogrand the power cables. A new album by female jazz vocalist Lyn Stanley played to demo the system. Later I learned that this album is an audiophile recording mastered on analog tape. It certainly sounded it with excellent tonal balance and an exquisitely clear and present vocal. The bass was tight and appropriate in impact and weight for a medium-sized speaker and room. There were some high-value components on demo here. I mentioned to the host that I had read in our letters column how some Melody owners had experienced terrible problems getting repair service but he assured me that it has all been addressed now. If I recall correctly, this may have been limited to European customers. AURALiC, YG Acoustics. I was pleased to see that my favorite YG Acoustics speaker, the Carmel ($18’00/pr) was the choice of AURALiC CEO Xuanqian Wang to demo his electronics. I have followed Srajan’s journey through DAC land and been considering purchasing an AURALiC Vega ($3’499) for myself. This show also debuted the AURALiC Aries streamer ($1’599). 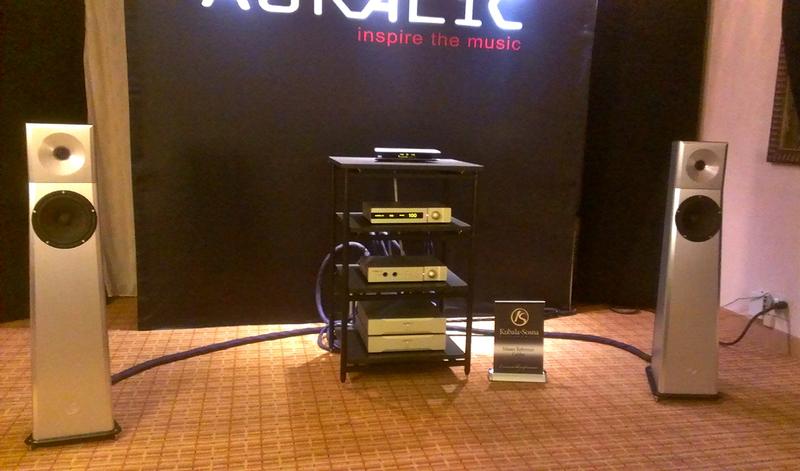 The remaining AURALiC components were the Taurus preamp ($2’199) and Merak monoblock amplifiers ($5’000). Xuanqian played a native DSD file that was a private recording he owned, as well as Mahler and a Chinese opera. It all sounded excellent with great transparency and dynamics. Even the demanding Mahler orchestral piece was very convincing. One special strength of this system was that it also sounded balanced, open and involving at low levels. This is a rare quality and not often heard at audio shows. This was a great little system! Tweek Geek: Waveform Fidelity, Acoustic Imagery. I happened to sit down right next to John Young, the UK-based owner of Acoustic Imagery. As he cheerily explained, his company provided the electronics, some of which turned out to be inside the new and rather chunky Tweek Geek BMF1 speakers (the flyer gave an estimated price of $20’000 the pair). Each speaker weighs 200 pounds and contains two side-mounted subwoofers separately powered by internally mounted Hypex 400wpc class D amps. A hornloaded Beyma TPL-150H pleated diaphragm tweeter handles the high frequencies down to about 450Hz where it crosses over to the front -firing 12-inch woofer12 PR 310 from Faital Pro of Italy. This woofer crosses over to the subwoofers from CSS Design with XBL motor below 75Hz. While this speaker may not be the most stylish in appearance, I like the thinking behind it. It’s kind of like an old 1970 ESS Heil AMT1 on steroids, punched up with the advantage of high-powered class D amps. There is no question that the AMT-style tweeter/midrange driver is excellent technology. The old ESS Heil AMT drivers consistently sell well on eBay. At a sensitivity of 98dB and impedance that does not dip below 6.5 ohms, I’d love to try a low-powered tube amp on them! The other electronics in the room were Acoustic Imagery Atsah NC1200 mono amps ($8’995 the pair), AURALiC Vega DAC, the new autoformer-based Acoustic Imagery balanced preamp Jay-Sho ($8’995) and Waveform Fidelity cabling. A musical selection by Yve Evans was played by Michael Garner, the head Geek. The impact and decay of the cymbals in this recording was exemplary. The prodigious bass capabilities of the speaker were demonstrated to room-shaking effect too. This room had a lot more going on than I thought! Esoteric, Cabasse. You better have plenty of rack space and cash if you want a full-blown Esoteric system in your home. Esoteric has a penchant for separating out almost every system function into another chassis. I certainly understand why but it does make for the proverbial audio shrine appearance as a female friend of mine likes to call my own comparatively simple rack of components. The Cabasse Baltic Evolution speakers ($18’00/pr) were partnered with the Cabasse Santorin subwoofer ($5’000). There was the following Esoteric gear in the racks: Esoteric P1 Grandioso SACD/CD player with a separate power supply ($40’000), single chassis/dual mono G01 Master Clock ($23’000), dual Esoteric Grandioso D1 mono DACs ($20’00/ea. ), Esoteric Grandioso C1 linestage preamplifier with separate power supply (premier showing of this component, $40’000), Esoteric Grandioso M1 monoblock amplifiers ($21’000 each). Digital music files were played from a MacBook Pro and Cabasse Stream Source ($500). Whew! The host played Diana Krall performing All or Nothing At All. I don’t like to hear Diana Krall at shows because her recordings seem to make any system sound good - which it did. However, the ensuing Mahler orchestral piece was much more telling. Even in this smallish room, there was great air and ambience. The horns blared from deep in the soundstage. String tone and dynamics were also excellent. I would definitely count this among the best rooms. Home Audio Sound: JBL, Levinson, Revel. Greg Burns, owner of Home Audio Sound, displayed some top-notch JBL, Levinson and Revel gear in two cramped rooms. Based in nearby Brighton, he is an authorized Harman dealer. The JBL Everest DD 67000 speakers were shoehorned with a pair of Levinson No. 53 Reference monoblocks, No. 52 Reference preamplifier, No. 512 SACD player and a White ParaMedic 26 equalizer (necessary given the room). It would be silly to pass judgment on this system under these conditions but suffice to say that Greg was playing mostly 1970s rock and it sounded better than I expected. I suppose he wanted to show his products and make connections for customers to visit his showrooms. He had another room with JBL S3900 speakers and Revel floorstanders. Since we both deal in used and vintage high-end electronics, we got into a lengthy discussion on the woeful situation (very high cost and numerous other obstacles) for owners of classic Levinson gear about obtaining service. In my opinion it seriously undermines the integrity of the brand. What a shame! RBH Sound, QAT Audio Technology. Here was another pair of what looked to be high-value statement loudspeakers from a Utah company called RBH Sound. The speakers on demo were the SX-8300 flagship towers ($6’90/pr). They are designed with three 8-inch aluminium cone subwoofers, two 6½-inch aluminium cone mid/woofers and a 1-inch liquid-cooled Scanspeak silk dome tweeter. Driving the speakers were electronics from the Beijing company QAT Audio Technology. The MS5 Music Server (2TB hard drive, $5’890) played digital files into the model 575 solid-state integrated amplifier (100wpc, $4’590). The system produced some impressive bass on a classical music selection but the highs were a little aggressive. On a more mellow selection, Celestial Echoes by Malia, the upper mids were much smoother but still a bit too forward for my taste. Sony Electronics. Near the end of the show, I was directed to visit here to witness the Nelson Pass 40th anniversary amplifier made from a stash of rare and essentially unobtainable Sony VFET transistors of superior quality. Acoustic Sounds was providing the digital files and analog records. The components included the Sony SS-AR1 speakers ($27’00/pr), a Clearaudio Ovation turntable with a Clarify tone arm ($6’495) and a Sony HAP-Z1ES file player ($2’000). The preamp was a Pass Labs XP-20 ($8’600) and Kimber Cables provided the connections. While I did not spend a lot of time listening, I heard Willie Nelson’s Stardust from a hi-rez file. I am intimately familiar with this recording which I own on vinyl. Contrary to my impressions of the Sony room from last year, the sound struck me as slightly on the cool side. However, I definitely needed more time to gather a fair impression. IsoMike: Kimber, EMM Labs, Pass, Sony. This would be my best of show but it was not a stereo demo. It was four channel. The special DSD recordings were done with Kimber Cable’s IsoMike microphone placement technology. This technology is primarily designed to prevent cancellation and nulling of frequencies. A large absorptive baffle measuring 8 x 8 feet was hung 20 feet off the floor with a DPA omni microphone mounted in each quadrant of the baffle. Many of the recordings available for purchase were done in cooperation with Weber State University’s prestigious music department. The IsoMike demo room was a large one on the first floor and equipped with a boatload of gear from EMM Labs, Merging Technology, Kimber cables plus a Pass Labs amp and four Sony SSAR-1 speakers (front and rear). The total cost of the system was $521’520! This was some of the best sound I have ever heard. One recording of the Weber State marching band had such lifelike dynamics that it was downright startling. On A Higher Note: Eclipse TD, Luxman, Mola-Mola, Synergistic Research. Philip O’Hanlon, the owner of On A Higher Note, is a consummate gentleman with excellent musical taste. I always look forward to visiting. his year Philip was showing a new speaker, the Eclipse TD712 Mk II monitors with two matching TD725SW Mk 2 subwoofers ($6’400 each). Apparently this Eclipse model is actually designed as a nearfield monitor so the room was not ideal. Synergistic Research installed some of their room acoustic treatments including the new Atmosphere device ($1’995). The Atmosphere is a Schumann resonance generator (similar devices are on the market already) that cleans up external RF pollution and helps the listener’s perception rather than the performance of the system per se. Unfortunately, when I entered, there was no demo of this device. Rather, Philip played some vinyl on the Luxman PD-171 turntable ($6’400) with the Soundsmith Hyperion cartridge ($7’500). The remaining electronics were a combination of Luxman (DA-06 DAC, $4’990) and Mola-Mola (Makua preamplifier including optional phono stage, $16’000 and Mola Mola Kaluga monoblocks, $18’00/pr). Sorry to say but the sound was well below what I am used to hearing in Philip’s room. Besides the excitement over the SR Atmosphere device, the Mola-Mola Makua was of special interest. It can be ordered as a line stage only for $13’450. Or you can add the DAC for an additional $5’000. There is also an innovative phono stage for $2’500. It offers a myriad of adjustments (loading, selection of EQ curves etc.) all from your iPad or laptop! 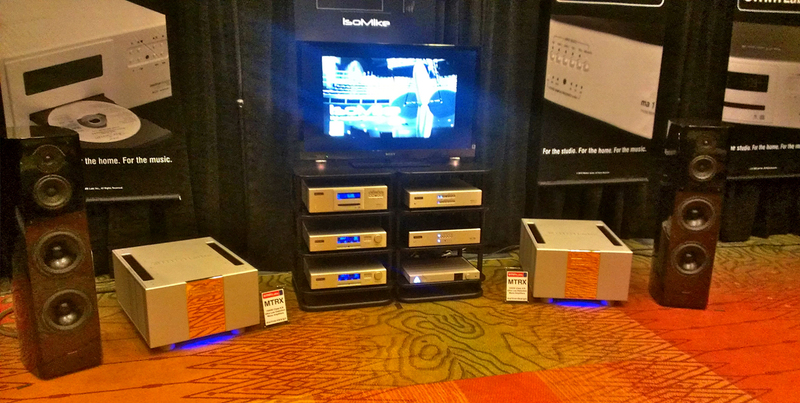 VAC, Focal, Clearaudio, Harmonic Resolution Systems. 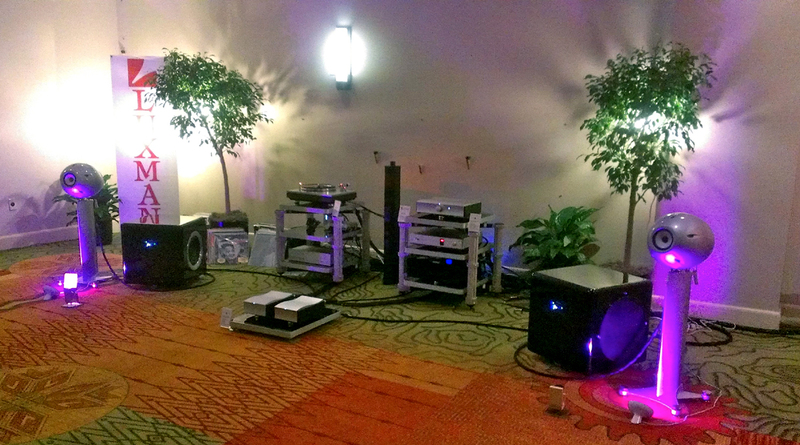 A large Focal speaker model is usually in this room every year. 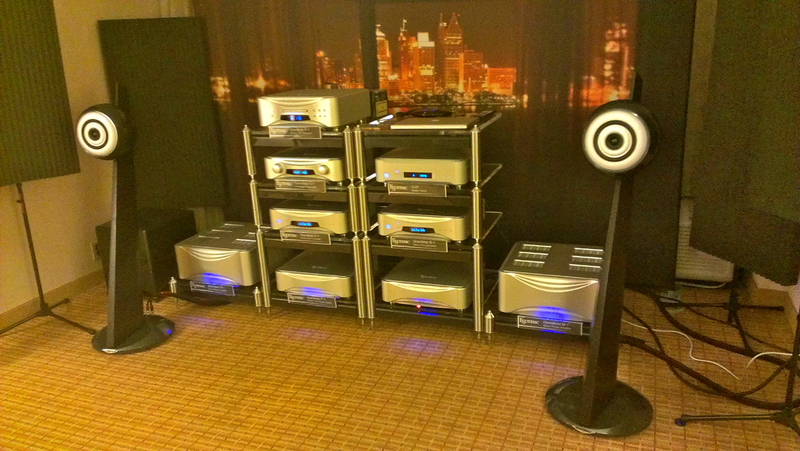 This time the Focal Utopia EM speakers ($195’000/pr) were paired up with tube electronics. Of course you better have some high-powered tube amps for these beauties. Kevin Hayes obliged with the VAC Statement 450 iQ monoblock tube amps ($116’000/pr), VAC line stage preamp ($66’000) and VAC phono stage preamp ($70’000). 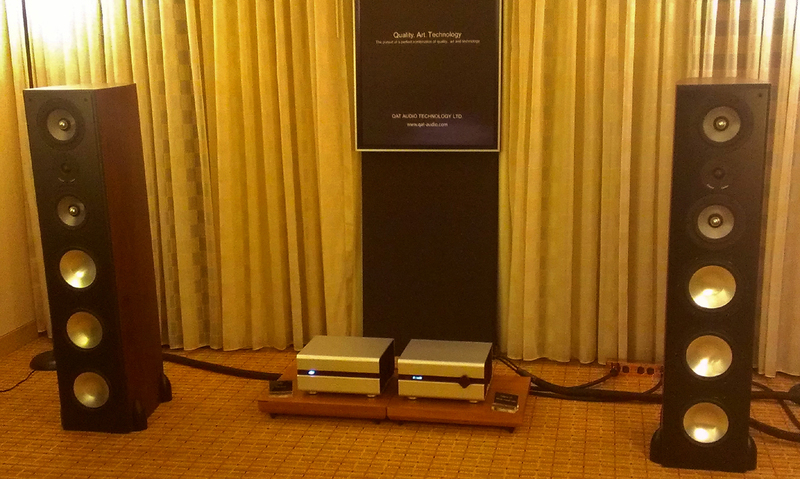 Esoteric provided the digital goodies with their P2 transport ($23’900), D2 DAC ($23’900) and G1 master clock ($22’900). Shunyata Research cables and power conditioning and Harmonic Resolution Systems racks completed the system. I think this system took the prize for most expensive, totaling at around $650’000. I’ve read a number of reports as well as discussion forums in which people raved about this room. Something wasn’t right when I was there because somehow this system managed to make the smooth-sounding Nora Jones’ Come Away With Me sound downright brittle in the upper midrange. I have no idea why but a friend heard the same thing. It was very disappointing. In my stint on a panel for Peter Breuninger’s AVShowrooms RMAF wrap-up video, Myles Astor expressed the same feeling about this room. Hawthorne Audio, Core Audio Technology. I take special notice of open baffle speakers, being an owner of the Bastanis Prometheus Mk. II. Plus, I briefly owned a pair of an earlier Hawthorne Audio speaker. From the looks of the Hawthorne Audio Rainier speakers ($15’00/pr) on demo here, the company has come a long way. It is a very smart design incorporating the increasingly popular AMT midrange/tweeter with a dipole waveguide down to 350Hz crossed over to two 15-inch Augie mid/woofers. Below 50Hz two 15-inch open baffle subwoofers with DSP/PEQ correction sat behind the main baffles. Core Audio Technology’s Kryptos Music Server ($6’000) provided the music files through an Ethernet connection to the Kratos digital amplifier ($2’500). I don’t recall the music selections but my impression was of a smooth and well balanced sound, albeit not quite as refined or dynamic as I hear from my Bastanis OB speakers. Blue Circle Audio. My friend Dean owns a Blue Circle preamplifier and Blue Circle monoblock amplifiers. He pulled me over to the display table of Blue Circle Audio designer Gilbert Yeung. Gilbert is definitely a maverick and the products he was showing were true to form. He is marketing power line conditioners built inside ABS pipe sealed at the ends with silicone. This no-frills conditioner (the FX2 6 X0e model retails for $495) does the job according to a fresh review of it by Paul Candy on Positive Feedback. Gilbert even had an oscilloscope demonstrating the AC cleansing effect of the conditioner. It’s fun to see an approach that is in such contrast with all of the hype and bling. IsoMike, Kimber: this room could easily be named the Best Sound of Show. However, it was a four-channel system and therefore I am putting it in a separate category. High prices – what was shocking is now de rigueur.